We have a systematic and disciplined approach when purchasing investment properties, putting each potential investment through a strict due diligence process. Our overall investment strategy and specialty is to purchase distressed properties at a deep discount – usually 30% to 50% below market value, and renovate and sell those properties to retail homebuyers and landlords. Our core business lies within our systems, education and knowledge of the real estate industry. We did not just buy a CD off the Internet and become a real estate investor overnight. How Do You Benefit from Private Lending? You, as the private money lender can benefit greatly from investing your capital. A real estate mortgage/ deed of trust provides you with security instruments you would not get with other investments. You also have added layers of protection because of how we buy, and because you have recourse available to you in case we were to default on the loan. What’s in it for you? How Do We Protect Our Lendors? Hazard Insurance Policy: This is where you as the private lender would be listed as the “Mortgagee” for your protection in case of fire or natural disaster, etc. 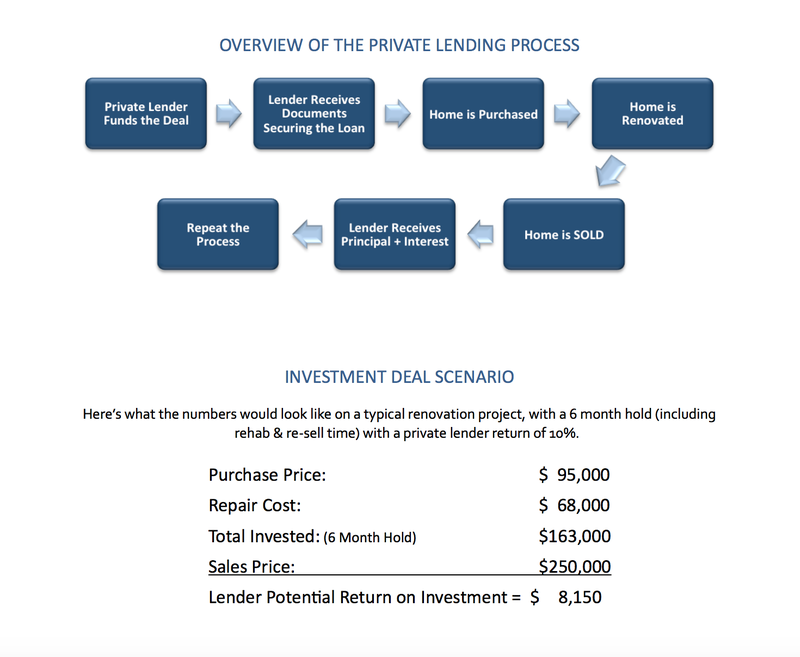 Common Ways Private Lenders Fund Deals? - Home Equity Line of Credit: A home equity line of credit is a very powerful source of funding that many people have and don’t even think of. Un-leveraged equity is dead money and it’s not making any interest. You can easily tap into that money. It’s a way to make sure you’re in the first position when we’re ready to pull the trigger and buy a property. - Cash: Cash held in most types of bank accounts can be accessed quickly and can fund your deals in minutes, instead of hours or days. Fees are generally minimal for wire transfers and cashier’s checks. - Personal & Business Lines of Credit: Personal loans and “signature lines of credit” can be obtained from most banks or credit unions by anyone with good credit and a stable income. : More and more private money lenders are using their IRA funds to invest in real estate. A self-directed IRA is essentially the same as a traditional IRA, but allows you to purchase a broader range of investments, including real estate. - Liquidated Securities & Investments: These Investments are a way to put your savings to work earning more money. However, if your stocks and investments have not performed as you had expected, it might be time to consider other investments. As you know, stocks can be liquidated as and when you wish. Sometimes you need to liquidate your investments because you need the money for something you want to purchase such as real estate. Minimum Investment: When working with private lenders, $50,000 is our minimum standard investment. When first investing with us, a lower initial investment amount may be agreed upon to ensure you’re confident when working with our company. Mortgage Terms: The majority of our loans are set up on an 8-12 month note; however, it depends on the size of the project. If we are doing a teardown and rebuild, we will have to wait on the county inspectors for many approvals - thus causing delays. We account for all of those details upfront and will give you estimated time frame for the return on your investment. Also, we do not pool funds - your funding will be tied to one piece of property secured by a deed of trust. Payment Schedule: Typically, we pay one large lump sum at closing on a short-term note. This is much easier to manage for both of us, especially if we’re working out of a retirement account. On a longer note, we will pay monthly just like a typical mortgage. 1st or 2nd Lien Position: The Investor, as “mortgagor,” has the right of first lien holder and Power of Sale on the property. The 1st lien position is placed behind a senior mortgage. You are probably used to hearing the term first and second mortgage. The second mortgage is a junior lien because it’s in 2nd position. The senior lien or first mortgage must be paid prior to the 2nd lien. When working with private lenders, $50,000 is our minimum standard investment. When first investing with us, a lower initial investment amount may be agreed upon to ensure you’re confident when working with our company. The majority of our loans are set up on an 8-12 month note; however, it depends on the size of the project. If we are doing a teardown and rebuild, we will have to wait on the county inspectors for many approvals – thus causing delays. We account for all of those details upfront and will give you estimated time frame for the return on your investment. Also, we do not pool funds – your funding will be tied to one piece of property secured by a deed of trust. Typically, we pay one large lump sum at closing on a short-term note. This is much easier to manage for both of us, especially if we’re working out of a retirement account. On a longer note, we will pay monthly just like a typical mortgage. The Investor, as “mortgagor,” has the right of first lien holder and Power of Sale on the property. The 1st lien position is placed behind a senior mortgage. You are probably used to hearing the term first and second mortgage. The second mortgage is a junior lien because it’s in 2nd position. The senior lien or first mortgage must be paid prior to the 2nd lien. If we haven’t already, it’s important to sit down and discuss all these details in person. We will need a clear definition of what your goals are, i.e. long-term investment or short-term, and the amount you are comfortable initially investing. At that point, we will present you with any current opportunities that fit that criteria or contact you as soon as we have one that fits.